Fifty years ago the Sports Medicine community was satisfied with describing the human physique according to three categories of body types: endomorph, mesomorph and ectomorph. Later on, primary care physicians began to associate and describe the increased risk of developing heart disease in terms of body shape; i.e. apple shaped for men and pear shaped for women. Today’s medical technology allows us to look further into the human body to the point where we can actually compare and contrast factors, such as quantity of fat cells, muscle fiber type, heart size, bone density, cardiac output, muscle mitochondria, and even the risk of contracting disease. The ability to measure these more specific variables and potential based upon genetics is important, because they give insight into the body’s ability to adapt and benefit from different interventions and treatment programs. The key to designing an exercise program is to help the body adapt to a specific stimulus – in other words, to achieve a specific training effect. Over the following weeks I’ll explore Cardiovascular Fitness, Body Composition (% body fat), and Disease Prevention, in ways that provide insight into the role genetics play. Your genetic profile can be an important guide in the successful pursuit of improving your overall health or increasing your level of fitness. First up, Cardiovascular Fitness. An individual’s ability to perform aerobic exercises like running, cycling, swimming or cross country skiing is ultimately determined by the heart’s capacity to deliver oxygen to the specific muscle groups engaged in each sport, as well as the muscle’s ability to convert oxygen and available fuel (food) into energy. Cardiovascular fitness can be measured through an Oxygen Consumption or VO2 test. An athlete wears a facemask over his mouth and nose while running or cycling at increasing levels of intensity. The mask is connected to a computer that is able to compare the difference between the amount of oxygen inhaled and exhaled with each breath. The key finding behind VO2 testing is that VO2 scores are linear with performance. In other words, athletes with higher VO2 scores have been shown to run, swim, ski and bike faster and longer than athletes with lower scores. 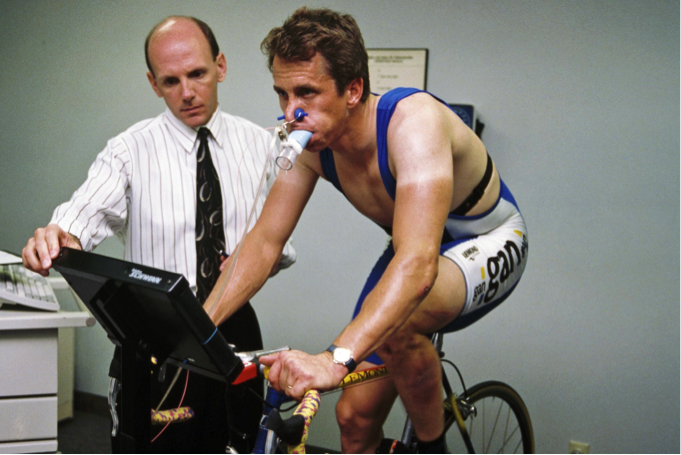 Dan Zeman with Greg LeMond, three-time winner of the Tour de France, testing VO2 levels to monitor and maximize training effect. VO2 scores in the general population range from 20 – 60 ml/kg/min, follow a bell shaped curve across the range of scores, are slightly higher in males, tend to decrease with aging, and increase when the subject maintains a structured exercise program. However, the most interesting observations are that people DO NOT respond the same way to the same training program, and world-class level endurance athletes’ VO2 scores are much higher, in the 80-95 ml/kg/min range. Elite athletes DO NOT have higher maximal heart rates than those whose VO2 scores are lower, but they DO differ in how their hearts adapt to training, allowing more blood pumped per beat. They also differ in how the mitochondria in their muscles adapt, resulting in a higher capacity to convert oxygen and fuel into energy. These observations are valuable, because they indicate a genetic component is at work in the adaptation to cardiovascular exercise. Consider the “sport of choice” of an Olympic Track and Field athlete. Each event has a gold medal winner who most likely realized at an early stage of training that he/she had a natural inclination to performing well in that particular event. One size does not fit all, and even Olympic athletes don’t adapt the same way to a specific training program. Some athletes are genetically gifted for short distances, while others are gifted for long distances. This doesn’t mean athletes can’t train for other events and do well; it just means they start off with a set of genetic gifts that may allow them to perform better in one event over another. In addition, most of us can benefit from a seasonal approach to training. Even elite athletes train with awareness of their genetic predisposition, knowing that the risk of sustaining an overuse injury is higher when training for a world record. They realize their peak performance and condition can only last for a limited amount of time. Variables such as maintaining an ideal race body weight, adequate rest, meticulous control of calories, and limiting the number of race days allows them to stay in world record shape for race day, ready for show time. The body also needs to rest. Without a legitimate off-season, the human body will begin to shows signs of muscular skeletal stress fractures, decrease in positive psychological mood states, poor sleep habits, weight gain, and finally a measurable drop in cardiovascular fitness or VO2 scores. This brings us back to the best questions to ask first: why am I doing cardiovascular exercise, what particular exercise best suits me, and how much is best for me? My best answer is also the simplest: choose a form of exercise that you find enjoyable, and choose a duration and intensity that allows you to speak a single sentence clearly and without hesitation during the exercise. It’s simply a “talk test.” See if you can talk easily while you’re walking, running, cycling or engaging in any cardiovascular exercise. I also encourage a variety of forms of cardiovascular exercise, and whenever possible, combine them with a social or personal agenda.